While Alfa Romeo develop plans for a new flagship executive sedan, the students of the Scuola Politecnica di Design (SPD) in Milan have presented their own design proposals for the car, which is widely dubbed as the 169. While Alfa Romeo develop ambitious plans for a new flagship executive sedan, the transportation design course students of the Scuola Politecnica di Design (SPD) in Milan have presented their own design proposals for the future car, which is widely dubbed as the Alfa 169. 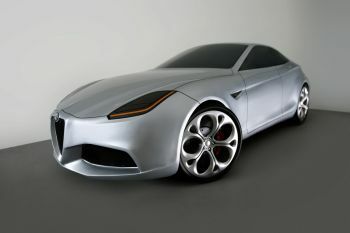 The design project was the focus of the 2007-08 Masters in Transportation Design course which briefed students to imagine a luxury, four-door successor to the Alfa 166. This year's course was under the direction of SPD tutor Mario Favilla. The course was carried out in conjunction with Centro Stile Alfa Romeo in Arese (Milan) headed by Italian Fiat Group Automobiles and Maserati Chief Designer Lorenzo Ramaciotti. The former head of Pininfarina's design studio oversaw the students' work. Nine finished project models were presented at the end of last month. These were "Alfa Romeo Camaenae" by Ryu Seung-Wook (Korea), "Alfa Romeo Coelus" by Ian Bunjak (Slovakia), Iulian Bumbu (Romania), "Alfa Romeo Tessa" by Murat Atvur (Turkey) and Adam Denning (USA), "Alfa Romeo 6C Torio" by James Edmund van der Merwe (South Africa) in collaboration with Artem Popkov (Russia), "Alfa Romeo Exelixis" by Gabriel Feyer (Brazil) and Kostantinos Paradeisou (Turkey), "Alfa Romeo Essentija" by Franco Grassi (Italy) and Alessandro Fiorentino (Italy), and "Alfa Romeo MilleMiglia" by Aleksej Ivaskievic (Russia). The SPD has a strong track record of attracting manufacturers to support its design courses. This year's Masters in Transportation Design 2008-09 course, under the direction of Filippo Perini, will be held in conjunction with Automobili Lamborghini.